Every time I see Topps' new promotional card, my temple winces in pain as a dormant area of my brain housing years and years of schooling cries out in vain. While it's not the entire promo card that makes me cringe, it's the baseball logo figured prominently just north of dead center. Has it hit you, yet? No? Alright, let me toss this nugget your way, "Today I went to the ATM machine, and when the LCD display prompted, I entered my PIN number." Anything? Still no? Hmm, let me try again. 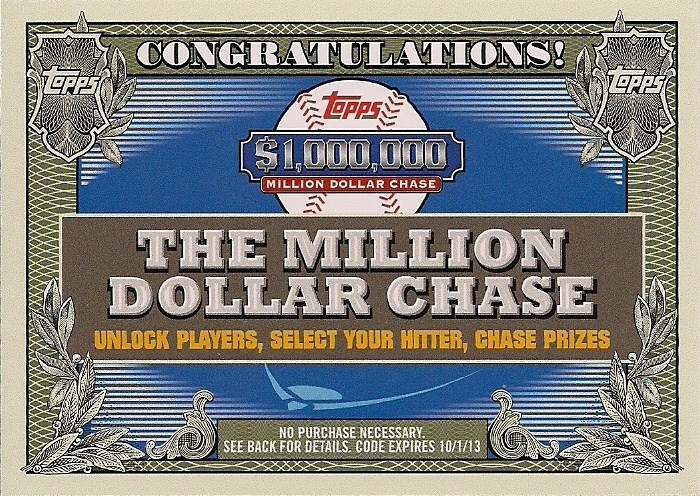 I'll spell out the promo for you..."Topps One Million Dollar Million Dollar Chase." While this Topps' ERR is not a direct example of the RAS Syndrome because no acronyms are used, it must be considered some variant of the affliction because of the $1,000,000 million dollar usage. $#!+ like this drives me crazy, but it does have it's advantages. I once got a hamburger for a penny (and a dirty look from the manager) because their sale flier said, "0.99¢ - Guaranteed!" English and math skills are important. But did you get your 1/100 of a penny change?